I make and sell hand crafted jewellery, both from my own web site and on the US based site 'for all things handmade'; Etsy.com. 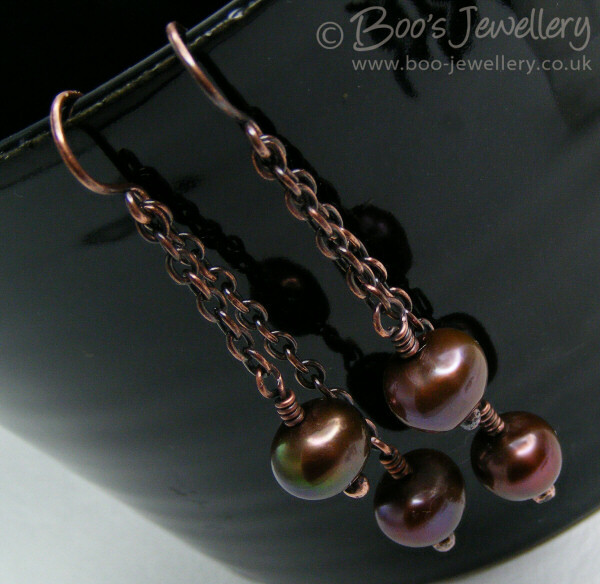 My two Etsy shops are at http://boojewels.etsy.com and http://BooPhotos.etsy.com (for my photo greetings cards) and my own site is at http://www.boo-jewellery.co.uk/. 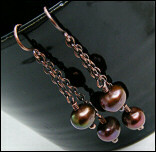 Please also see my blog which has further discussion of photography and jewellery subjects. 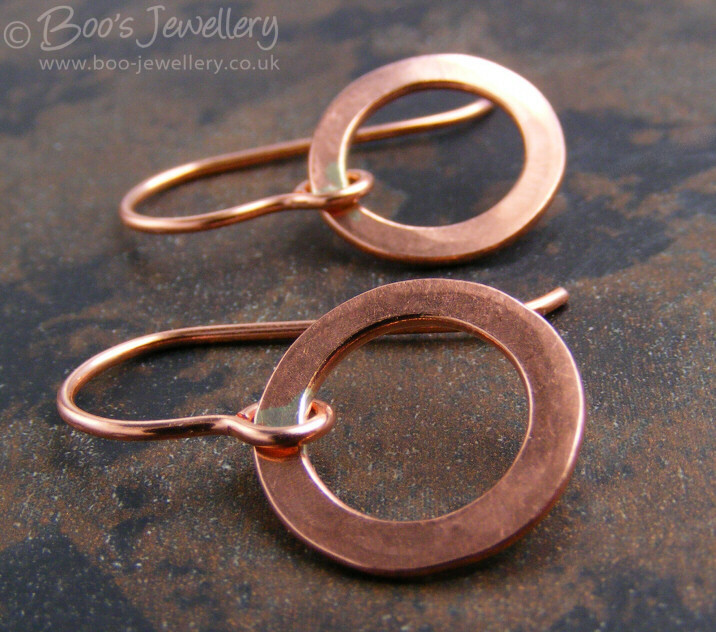 One subject that comes up daily in the Etsy forums and my own mailbox is how to get good product photographs of hand made items, especially jewellery and small items. There are a couple of very common problems that artisans encounter especially; dark photos and grubby or mis-coloured backgrounds when jewellery has been placed on something white or light coloured. My aim is to address these problems, which are easily overcome with correct technique and a little understanding and to give some guidance for people who are crafters predominantly, not photographers. I've put down many tips as they have come to me, but it will be a work in progress that I'm sure to expand upon. I'm assuming most readers will be working with compact cameras predominantly - and not all cameras will have features that I reference. Get your camera manual to hand and get to know your camera. Tip: If you try to make some of the camera setting changes suggested below and you can't find the controls, take the camera out of Auto mode and try P (Programmed Auto) instead. This is an automatic mode, but generally allows the user more control over some of the settings. In Auto mode, the camera tends to decide everything for you and some settings are therefore disabled from menus. Where should I take my photos and how should I light them? If you're an artisan wanting to sell your wares, you probably won't have an appropriate set up for taking photos initially, you won't have studio lights or slave flashes and brollies, but it's very easy to improvise something at home - probably with items you already have - it certainly isn't necessary to go mad on spending money until you really know and understand what's needed. You can certainly buy an assortment of light tents, cubes and spheres and appropriate lighting equipment, designed for just such users to get reliable product shots, but before you shell out any money, try improvising first. There are many tutorials on-line for making your own light tent/box or micro studio, so I'll not cover that in detail here, but many of these very effective home made studios only need inexpensive or to-hand items like a cardboard box, tracing paper, white craft board, translucent fabric or aluminium foil. You can even cut a hole in a translucent mixing bow and light the outside of that, or make a cone from tracing paper. If you only have one light source, some scrunched aluminium foil lining the side opposite helps reflect some light back on your subject. See my article here in the blog on making my own free diffuser from a small translucent bucket container. The principles are easy, diffuse your light so that you don't get harsh shadows and get as much light as possible onto and around your subject - which you can do with assorted lighting and reflectors. If you're going to use a lamp(s) of any sort, investing in daylight bulbs may be really helpful and make it easier to get correct colours. But by far the easiest is to take advantage of natural daylight - hazy bright skies are the best, lots of surrounding and diffuse light. Try and avoid direct sunlight, it's harsh and very directional and casts sharp shadows and can be yellowish in colour. By the evening, light is taking on a warm glow and casts long shadows, so ideally, morning light before the sun hits your work area would be best, preferably on a bight and lightly clouded day. If you have to work in sunshine, improvise a diffuser with something like tracing paper or thin white fabric and use a reflector to put some light back from the opposite direction. Make sure that you don't cast shadows either. When I've had larger subjects to photograph and wanted to use sunlight, I've used a white folding fabric laundry bin. It's a flimsy white nylon fabric tube stretched taut over a metal coil, that allows it to be folded flat. Just be mindful that if it's cylindrical, it might roll, so fix it down safely. The lens photograph on the right was taken this way, on a sheet of white paper inside the tube. But the weather doesn't work to your photography schedule, so this utopia may not be possible for many people, especially if your craft is a hobby on top of a regular job. So you may have no alternative other than to rig something up indoors. If you have a large window adjacent to a suitable place to work, that might offer advantages over working outside, where other factors like wind and temperature may adversely affect your subjects - or your own comfort factor. How do I get enough light? You can supplement outdoor or available window light, by reflecting some back onto your subject. You can buy photographic reflectors, but you can get very good results from a home made one for pennies - I've been using the same one for many, many years. Get a suitable piece of card; a cereal carton or box side will do. Crumple up some aluminium foil, then stretch it out again and burnish it flat and stick it shiny side uppermost, to your card. The crumpling helps to scatter and diffuse the light, so you don't get your diffuser reflected in your subject or create harsh spots of light. But the amount of light isn't as important as the quality of light and how you expose for what you have. People get dark photos and think this is because here wasn't enough light. There may have been well enough, but the photo was underexposed for the particular scene - more of that shortly. When you take a photograph, the amount of light needed to enter the camera in order for an image to be recorded is known as the exposure. Three factors determine the exposure - the shutter speed, the aperture and the ISO of the sensor. To explain; the shutter speed is how long the opening in the lens stays open to let light in when you touch the shutter button, the aperture is how big the hole in the lens iris is when it opens and the ISO is how sensitive the sensor of the camera is to the light. Exposures are specified in units called 'stops'. I'll not explain that further here, just be aware that I may use this term - all you need to know is that it's a 'unit' of exposure. It's rather like filling a bucket from a tap, you have to get enough water to fill the bucket - the harder you run the tap, the quicker it fills. So with your product shots, the more light you have, the less time the shutter has to stay open in order to expose the photo. If your shutter is open for too long, it can record movement - you wiggling the camera, or your subject blowing in the breeze etc. So more light has this one big advantage. You can potentially take your photos in very low light levels, the camera will simply choose an appropriate exposure to ensure that it records enough light, but this may not be a very practical one for you and may give poor results for various reasons. The faster your shutter speed, the more likely you are to get a nice sharp, in focus photograph. So having good light is advantageous in this regard as much as any. Unless you're especially steady, watch the camera settings and try and keep a shutter speed in the region of 1/100 second for wider angle shots, that's fast enough to comfortably ensure a safe exposure for most people. You can check what shutter speed the camera is choosing if you pre-focus the camera by half-pressing the shutter button, your camera will often show you the exposure it will use, so watch this and check the numbers. If you don't feel steady or are getting fuzzy results, which might indicate camera shake - movement recorded during the exposure time - you can try an inexpensive table top tripod or just improvise a stand with a small towel folded on some books that you can nestle the camera in. Because you can still jiggle the camera when pressing the shutter button, use the camera's timer if it has one - they often have a choice of 2 or 10 seconds. This way you can press the shutter button gently, remove your hand and the camera has time to settle before it takes the photograph. My favourite tool for such occasions is a bean bag. I have several small suede pillows loosely filled with polybeads - they allow me to nestle the camera in and position it fairly accurately, but are light and easy to carry - with the added bonus of protecting the camera in my bag. If you're wanting to get close to small subjects, you're going to need to use the macro setting of your camera - this allows you to focus from much closer than normal subjects. 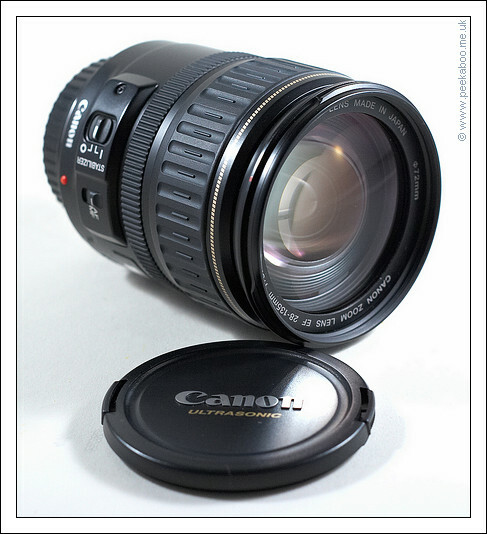 Check the manual for the camera to see what the minimum focus distances are for the various modes. It's important for you to know this - if you get closer than the mode you're working in can cope with, your camera either won't focus at all and won't then take the shot, or possibly worse, it might focus on the background if it's a little further away but within focus distance and your subjects might end up woolly and fuzzy in the foreground. 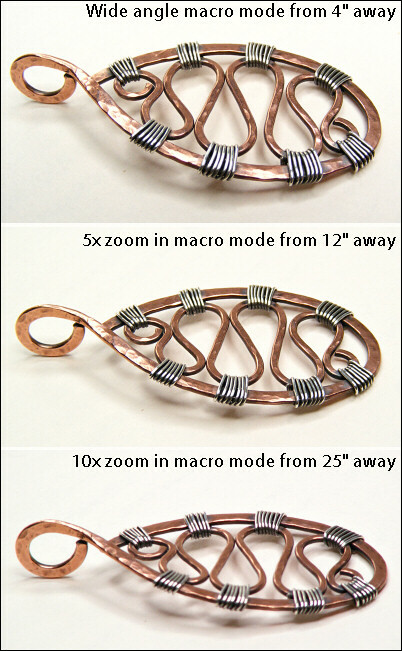 In the three photographs above, they each have a similar field of view of the object, but were taken at different zoom lengths and from progressively further away, as necessitated by the camera's limitations on macro focus. The change in perspective is purely because I'm very short and made the mistake of placing the subject too high to step back and maintain the same angle of view. The last frame is slightly soft and woolly because I had insufficiently fast shutter speed for the focal length - see below. Compact cameras in macro mode can probably focus from around 100mm (4") away from your subject which gives you a great field of view and makes your subject nice and large in the pictures, but it has drawbacks too. This might make you too close to the subject to be practical, you might be in danger of knocking your carefully staged display and casting a shadow with your head or the camera - and reflections in shiny subjects can be problematic too. There are a couple of things you can try though if faced with these problems. Many macro modes allow you to also zoom in your subject too. This allows you to take the same field of view photograph, but from physically further away. Again, your manual will help you with numbers, but the more you zoom in at a macro setting, the further back you may need to be to ascertain focus. Where you might have been able to focus from 100mm away (4") in macro wide angle (usually W on the zoom control), zooming fully (towards T) may require you to be up to 1000mm (39") away. Zooming in overcomes your shadow and clumsiness issues, but brings its own problems. Remember that we talked about shutter speeds and camera shake earlier and the necessity to have one fast enough to eliminate camera shake being recorded? Photography is governed by a lot of maths and physics and this is one such area where it surfaces. The more you zoom in (not just macro shots, all photography, with all cameras), the faster your shutter speed needs to be to eliminate camera movement from being recorded. The longer focal lengths of zoomed photographs, exaggerate camera shake. So if 1/100 shutter speed was needed to keep the camera steady at wide angle, now if you zoom in fully, you will need it to be much, much faster to prevent blurry photos through movement. If you have a 5x zoom camera, you can multiply that figure by 5 - so now you need 1/500 second shutter speed. So whilst zooming in macro overcomes some problems, you can only really do it reliably with good light - so be aware if you zoom in to see your subject better, you might end up with soft photographs if you don't have enough light to keep the shutter speed up. There's also another potential problem with zooming and having sufficient light that you need to be aware of. As you zoom in, the aperture of the lens (i.e. the diameter of the hole that lets light in) tends to close down to a smaller hole (this is just the limitations of the lens construction as it moves to zoom), therefore necessitating it being open for longer to let sufficient light in. So if, for example, your camera is giving you an exposure of 1/100 second shutter speed at an aperture of f3.5 for a wide angle (non-zoomed) macro photo and you zoom in the maximum the camera allows, the aperture might now be f6.3 - a much smaller opening, so the camera, in order to achieve the same exposure, needs the shutter to stay open for longer and will need a shutter speed of something like 1/25 second. So you potentially face the double whammy of needing a faster shutter speed to eliminate camera shake at the longer focal length and yet the camera may only be able to achieve a much slower one because you've zoomed. So watch those numbers - if you find your photographs are very blurry after you've zoomed like this, one of these factors, or possibly both, is almost certainly to blame. When you're in macro mode especially and close to your subject, your depth of field is very shallow - the amount of the subject from front to back that is in focus - may not be very much, so if you pre-focus the camera on part of your subject you want in focus, but then wobble a little before taking the shot, it may not end up sharp where you want or expect, so ensure that you're physically steady, lean your leg or hip against a structure nearby, for example. Your depth of field also extends in front of where you focus as well as behind, so don't focus at the front of your subject, focus a little further back on it to ensure that you maximise the depth of field you have. As a generalisation; with macro settings on compact cameras, your DOF is approximately half in front and half behind your point of focus. With any subjects with eyes, like dolls or toys, always focus on the eyes. Many cameras have the option to change the ISO or sensitivity of the sensor to the light hitting it. You may have ISO numbers like 50 (or 64 or 80), 100, 200, 400, 800 and 1600. Increasing the ISO allows you to achieve a faster shutter speed for the same amount of light, but this can be problematic too. As you increase the ISO, you can also diminish the image quality - the colours and contrast can change and you may see a grainy texture and coloured splotches on your photos - this is called noise - it is the trade off you have for electronically increasing the sensitivity of the sensor. Many compacts are poor performers at the higher ISO numbers, so perhaps do a little trial and error with your camera to see how acceptable the higher ISO photos are to you. Changing it to 200 or 400 shouldn't be too problematic and can certainly buy you extra shutter speed and any degradation in quality might be preferable to camera shake, but be mindful of higher numbers unless you're familiar with your camera and have software and skills that can get the best from these images. Reflections - can you see yourself in your metalwork? 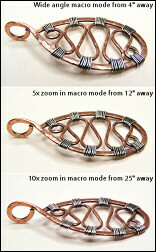 By carefuly positioning yourself and the camera, you can eliminate your own reflection in shiny props and subjects. Reflections can be a problem when you get in close with shiny subjects. If you can see the camera and your hands reflected when you are working very close to shiny subjects, there's a quick and easy way to reduce this problem. I use a square of kitchen paper and cut a hole in the centre the diameter of the camera lens and poke it through the hole. Hold the camera from behind the paper and ensure that a corner doesn't flop in front of your lens or cast any shadows by getting in your light source - but this simple step easily helps prevent details of your hands and clothing in your reflections. If you are picking up reflections in larger surfaces such as your background props, this can usually be eliminated just by changing your position. If you're taking a photograph straight on to the subject, the light is bouncing back and forth along a straight line between the lens and subject - and if you're immediately behind the lens, the light from you - i.e. your reflection - ends up being recorded by being bounced back directly through the lens. If you move yourself off to the side, below or at an angle, you break this line of sight between the shiny surface and the lens and eliminate yourself from the reflection. Imagine standing in front of a mirror, you can see yourself reflected in it. But if you take a step to the side, you can no longer see yourself in the mirror, but you can still see the mirror itself. This is all you are trying to achieve, remove yourself from the recorded scene. If repositioning isn't possible, or introduces different reflections - lights, windows, furnishings or ceilings - you can replace the unwanted reflections with a more desirable one without distracting details, by holding something neutral in their place to reflect instead. A piece of neutral grey or black paper, card or fabric (preferably matt) held or propped in line with the reflection you were hoping to eliminate will replace the distracting details with something flat instead, allowing the form of your object to shine without the surrounding objects showing. Using black paper to reflect in the copper, I was able to bring out the true colour. Sometimes you need some reflection to give the object form - shiny flat metal surfaces can appear totally white and devoid of details if all they reflect is light, especially if you've done a good job on diffusing your light source and getting a good all round level of light. Introducing a creative reflection to give a shiny surface form, or to allow the true colour, or a particular surface detail, to show, is often desirable. For small metal jewellery pieces, I use some matt black paper and hold or clip this adjacent to the object so that it reflects from the shiny surface. You usually only need a small piece - often a long thin strip gives a nice banding effect making the metal look shiny - you don't want to soak up or block too much of your available light, just enough to create a desirable reflection. Just move it around, whilst looking through the camera, until you get the desired effect. I've written more on this subject in my blog - about controlling reflections in shiny photographic subjects, with some before and after photographs. Whilst you're working, always check your previews in the camera LCD display from playback. Don't wait to see how the photos look on your computer, check as you go along - check every time you change something and zoom in on the resulting photos too, to check that they look in good enough focus. Why is my white background looking blue? All light has a colour cast - we don't notice it as our eyes and brain adjust and compensate for it automatically. 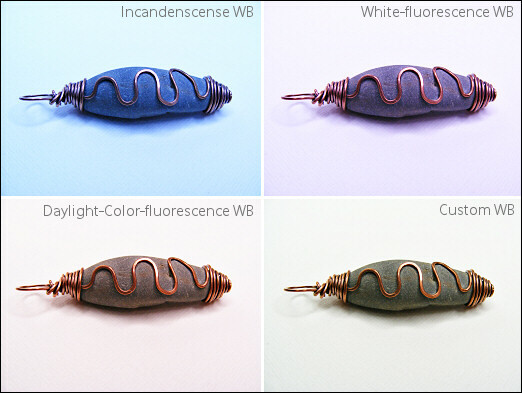 Different light sources have different colours; sunshine is yellowy, tungsten/incandescent light bulbs are orangey, fluorescent tubes tend to be green-ish. If you take a photograph which contains something white and you want it to look white - you need to tell the camera to compensate for whatever colour cast your light source has - it doesn't automatically compensate the way your eyesight does. 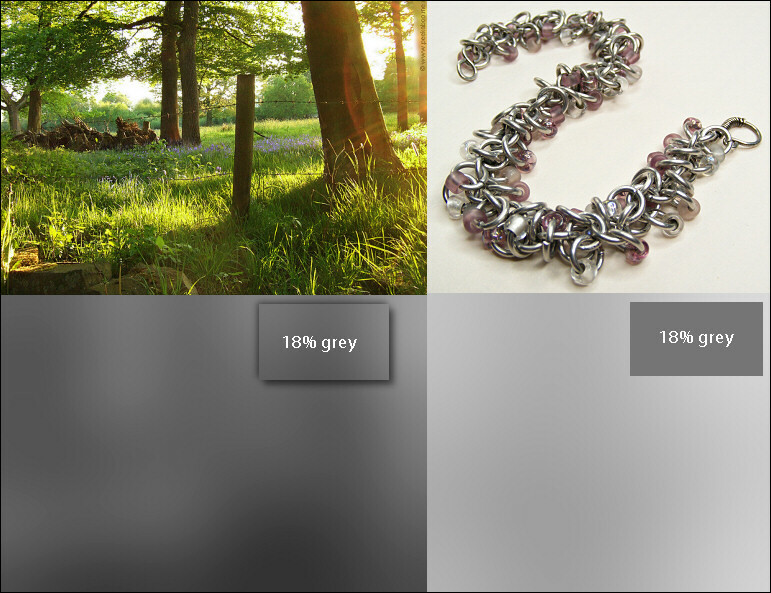 This is the white balance (WB) feature of your camera. Using the wrong white balance in these photographs has caused some really unpleasant colour casts. The bottom right one uses a custom WB and gives the best results. The background was ivory, not white. Please click the photo for a larger view. Compact cameras will default to an Auto WB setting, which does its best as you go along to measure the light colour and compensate for it. For many purposes, this works well, but if you get undesirable and inaccurate colours in your photographs, this is likely to be the culprit. If you don't have a specific WB symbol (left) showing in your display, it will be in Auto mode. If you can't find how to change it, this option may be disabled in Auto exposure mode, so select another one, like P (programmed auto) to have the chance of changing such settings. Most cameras will have an Auto WB setting and several pre-sets for particular scenarios and then often an option to set a custom WB - which will come in particularly handy if you're using mixed lighting or can't just get the right results from one of the default settings. 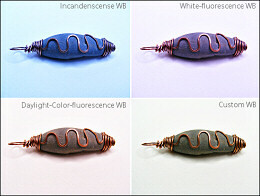 Perhaps try setting it to one of the pre-set options first, choose the one most appropriate for your lighting source. If you're outside in daylight, but not direct sunshine, try the WB preset with the cloud symbol - that's clouded daylight - and it tends to give the most faithful colours where your light is neutral (it's a good one to choose to catch sunsets faithfully and the like - it messes least with the colours) - if you choose sunlight and it isn't, your images can end up too blue - Auto WB sometimes tends to leave daylight a little cold for faithful colour rendition. If you're using mixed lighting sources, say with artificial lights indoors with different bulbs or tubes, a custom white balance may be necessary to give the best results - you'd need to consult your camera manual for exactly how to do that - but it usually requires you to take a photo in the lighting (best pointed at something neutral like a white, or preferably neutral grey, sheet of paper) and telling the camera that is the lighting source colour to compensate for. Why do my photos look so dark? How can I get more light on my photos? How do I lighten my photos, they're too dark? This illustrates how a general scene, when totally blurred in monochrome, has an overall tonality of 18% grey. 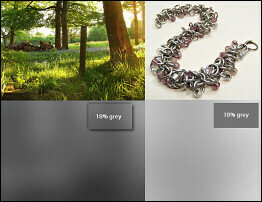 The jewellery photograph is significantly lighter than the 18% grey. Please click the photo for a larger view. Instead of trying to lighten already-taken photos in post processing, which takes time and won't always get good results, if you find that you get consistently darker photos than you're happy with visually, try using the Exposure Compensation setting of your camera - even basic models should have it. The camera is set up to try and ascertain an exposure setting for all general subjects, working on the assumption that you have an overall average tonality of 18% grey in most scenes - imagine a typical scenery or holiday photograph with various trees, buildings, grass, people and sky - it averages fairly predictably to an overall tonality of 18% grey. With jewellery subjects especially, you have a lot of bright shiny surfaces that are light and reflective and you want them to remain that way in your images. If you use a bright background, you further exaggerate this issue too. The camera, in trying to compensate for the overall lightness in order to get its 18% average tonality, will tend to underexpose, making your shiny subjects darker than looks good for jewellery and making any light backgrounds look muddy and dirty, see below. So if you're using any of the automatic modes on the camera, where it determines the exposure as you take the shot, you need to tell the camera that your subjects are brighter than average scenes - i.e. use your Exposure Compensation function. You want the camera to compensate for the lighter, brighter, reflective subjects and not actively darken the results. The left hand version is perfectly correctly exposed according to the camera, but looks far too dark and much better on the right with +1 stop of Exposure Compensation (EC/EV). Please click the photo for a larger view. So if you set Exposure Compensation ('EC' or sometimes called 'EV' = Exposure Value) at something like +1 stop (you probably have a scale of something like -2 > +2 in third stop increments - so do a little trial and error) you'll find that your jewellery subjects will come out much brighter overall and won't need as much subsequent correction. This will work regardless of what technique you use - macro setting, flash etc. - you just need to tell the camera to keep these particular images a little lighter than it's trying to from it's default exposure settings algorithms. The converse is also true if you use a very dark background or have darker than average subjects, you will get wishy-washy grey looking blacks, because the camera has tried to lighten the images, not knowing they were darker than average. Don't forget to zero it again for normal subjects or they'll come out far too light/dark. And keep checking that playback - if your images don't look right in the camera, try changing things until they do. If you increase ISO to get faster shutter speeds, you may get noise in your images as grain and coloured splotches, so choose this option with care. � Boo. 2006-2009. All rights reserved. Permission required for all and any uses of any content. See portfolio for more information.